Today is January 20, 2019. Something in the sky is happening today. Did you see it? It’s an unusual event, but certainly not unprecedented. It’s a Total Lunar Eclipse combined with a Super wolf moon. Some people call this “celestial event” a “blood moon”. I don’t know about you, but I really enjoy looking up at the sky. What does God say about the sun, the moon, and the stars? Genesis 1: 14 Then God said, “Let there be lights in the expanse of the heavens to separate the day from the night, and let them be for signs and for seasons and for days and years; 15 and let them be for lights in the expanse of the heavens to give light on the earth”; and it was so. Luke 21:10 Then He continued by saying to them, “Nation will rise against nation and kingdom against kingdom, 11 and there will be great earthquakes, and in various places plagues and famines; and there will be terrors and great signs from heaven. God gave us the sun, the moon and the stars not only to give light on the earth, but also for signs…..Hmmm….God gave them to us for signs. In Luke 21, Jesus’ Disciples asked Him a question. This same question is asked in Matthew 24, but with additional information. What did the Disciples ask Jesus? Jesus told His Disciples that when they SEE these signs come to pass, they should “lift up their heads” because their Redemption draws near. (Luke 21:28). Jesus then began to tell them the Parable about the Fig Tree. The above signs happen all the time, BUT, Jesus gave His Disciples a little more information so that they would have a better understanding of WHEN to lift up their heads. Jesus’ timing clues are contained within the parable of the Fig Tree. Understanding the Fig Tree will give us some very important clues regarding the “timing” of Jesus’ return. We may not know the day nor the hour, but it may be possible to determine the “season” (general time period). A Parable is simple story used to illustrate a moral or spiritual lesson. Luke 21: 29 Then He told them a parable: “Behold the fig tree and all the trees; 30 as soon as they put forth leaves, you see it and know for yourselves that summer is now near. 31 So you also, when you see these things happening, recognize that the kingdom of God is near. 32 Truly I say to you, this generation will not pass away until all things take place. Jesus is speaking about the Fig Tree. Where have we seen the Fig Tree before? It is thought that the Fig Tree was somewhere near the tree of the Knowledge of Good and Evil in the Garden of Eden because Adam and Eve attempted to clothe themselves in fig leaves. The Old Testament Prophets use the symbolism of the Fig Tree to describe Israel. In the New Testament, Jesus clearly refers to Israel as the Fig Tree. The parable was preceded by Jesus’ words: “Except ye repent ye shall likewise perish”. The owner of the vineyard is the God of Israel (Isa 5:7). The dresser is the Messiah, who, three years into his mission, would, through his digging and fertilizing, make the nation bring fruit unto God. At the time of the utterance of this parable, the fate of this nation was still not decided. Jesus still had half a year of his dressing work before him. After Jesus’ triumphant entry into Jerusalem (Palm Sunday), the end of Jesus’ mission was fast approaching. Returning from Bethany, the Master approached the fig tree and looked for fruit in it. Having found none, he passed this sentence on the tree: “Let no fruit grow on thee henceforth for ever” (Matt. 21:19). After three and a half years the dressing work was complete, Jesus wanted to show that the fig tree brought no fruit. The fate of the tree was decided. The fig tree immediately withered. How soon was Christ’s prophecy about the withering of the symbolic fig tree to be fulfilled in Israel? Forty years after Jesus cursed the fig tree, forty years after Jesus’ crucifixion and Resurrection, In the year 70 A.D. the Jewish temple was destroyed by the Romans. No longer was there a place to offer sacrifices, the opportunity to serve the Lord according to the precepts of the Law ended. Jerusalem fell into ruin, and the whole nation was expelled from their own land and dispersed throughout the world. The Roman destruction of the Jewish Temple in 70AD was a fulfillment of the cursed fig tree, showing that YHWH had removed His Favor from Israel. The softening of the branches and the bringing forth of leaves represents the return of YHWH’s favor to Israel during the time of the establishment of the Kingdom in Christ’s second advent. Jesus was telling His Disciples that once Israel returned to her land, (fig Tree softened and puts forth leaves), THEN it is almost time for Jesus’ 2nd coming as He brings His Kingdom to earth. Jesus also told His Disciples that “this generation won’t pass away until all this is fulfilled”. What is Jesus saying? He’s saying that the “Fig Tree Generation”, the Generation that is alive during the time that Israel returned to her land will be THE Generation to SEE the return of Messiah Jesus. After 2000 years, Israel returned to her land in May, 1948, and just reached her 70th year mark on Jerusalem Day, 2018. We will see in future posts the significance of 70 years for Israel. So although there have been many blood moons over the past 2000 years, those that have occurred during “this generation” seem to be of particular importance. 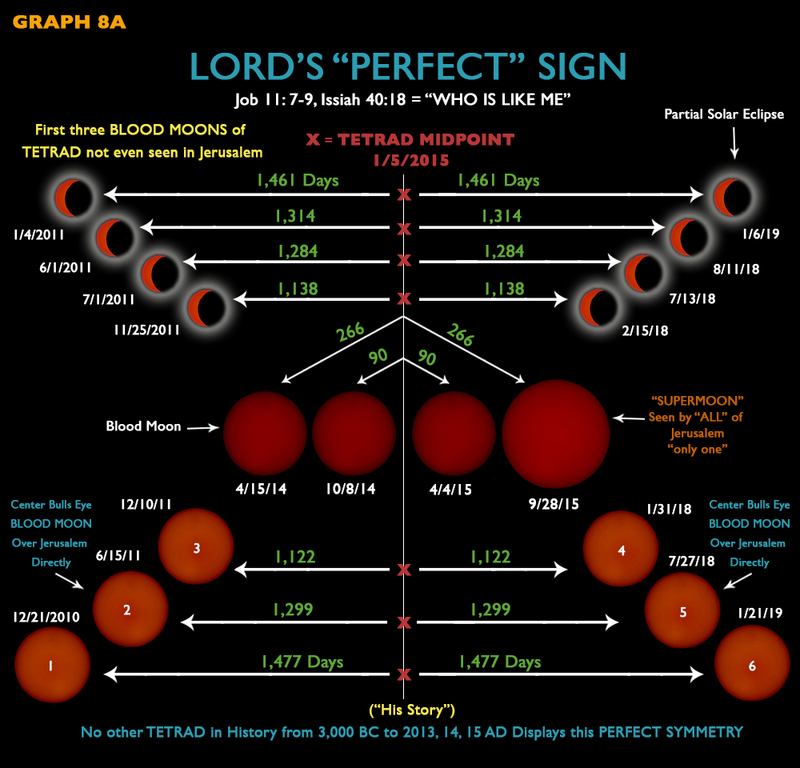 There was a blood moon tetrad that occurred just after Israel returned to her land. A “tetrad” is a set of 4 back to back lunar eclipses or blood moons that occur on the Jewish Feast Days or the Holy Days. There was a blood moon Tetrad that occurred just after Israel retook Jerusalem in 1967. And there was a blood moon Tetrad as Jerusalem approached her Jubilee (50th) year in 2017 and Israel approached her 70th year in the land starting in 2018. In-fact, there is quite a perfect and symmetrical astronomical phenomenon that began in 2011 and has continued through this final blood moon (in this series) on January 20, 2019. There will be more lunar eclipses after this one, in-fact, there’s one scheduled for 2021; however, tonight’s blood moon on January 20, 2019 completes the Lord’s perfect symmetrical signs. Could this be a coincidence? Sure…It could be a coincidence that this perfectly symmetrical sign completes just prior to Israel COMPLETING her 70th year in the land (Jeremiah 25: 12-13/Jeremiah 29: 10-14). It is absolutely possible that it’s a coincidence that the completion of this symmetrical sign just happens to “split” Donald Trump’s Presidency in half on what was inauguration day. It’s certainly possible that it’s a coincidence that President Trump’s “Deal of the Century” was just leaked, and that he plans to divide Jerusalem and give parts of it to the Palestinian Authority. Most people will see these solar and lunar eclipses as random chance, “freaks of nature”; however, I think it’s best to heed the words of our Lord and Savior Jesus Christ who tells us that when we SEE these signs occurring during the fig tree generation, we should lift up our heads because our Redemption draws near. God of Heaven Come down….